A periodic table in your pocket.Or your desk. Or your lab. EXPLORE AND LEARN ABOUT THE DIFFERENT ELEMENTS. Explore all of the elements directly at your fingertips. Explore and learn about different elements, whether you're a chemist, a student, or an enthusiast. Search for and filter out different elements. Tap to learn more. 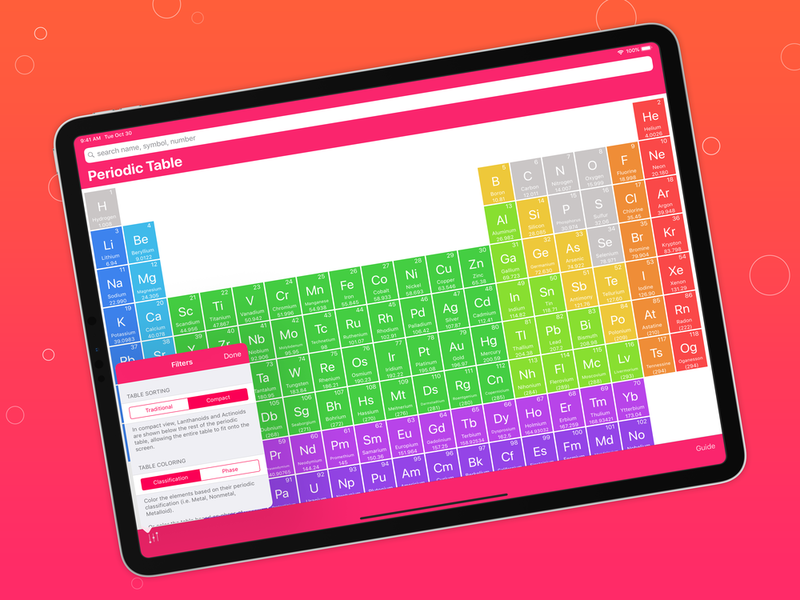 The complete Periodic Table at your fingertips. Every element, all 118 known to humankind, shows information including symbol, name, atomic number, atomic mass, electronegativity, electron configuration, and year of discovery. Additionally, view the physical states of elements at STP, or 25ºC. Each entry is accompanied by general information on Wikipedia, images, and a live animation of the atom itself. Optionally, find out more information from IUPAC or Wikipedia. Elements are laid out in a clear and concise manner. A beautifully, color-coded table helps you quickly distinguish which elements are which and their relevant series. View the entire table at once with compact view or scroll through with the traditional view. Quickly search and filter elements on the table. Search by name, symbol, mass,or number. Find just the element for which you're looking. Press on any element to quickly peek at its details before really getting into its information. Press on the Elementium home screen icon to quickly search elements or view the periodic table color coded by either series or physical state.